Homeopathic Medical System is officially recognized by Government of Pakistan. The system of training, examination, award of diplomas in homeopathy and registration of homeopaths is controlled by National Council for Homeopathy. The Council works under the Ministry of Health, Government of Pakistan and is responsible for formulating policies related with homeopathic practice, conducting examinations, approving new homeopathic colleges and registering the practitioners. Undergo a four years’ training course and qualify. Registration by the National Council for Homeopathy as homeopathic medical practitioner. In Pakistan, no one is allowed to practice homeopathy without this registration even if he/she holds the DHMS. Registration with the Council also makes a person eligible for the job of homeopath in government hospitals in Pakistan. There is no shortcut to this process. 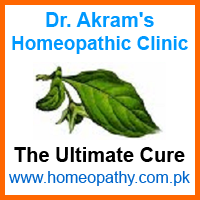 As of now in 2007, Pakistan has approximately 140,000 registered homeopaths and about 140 homeopathic colleges. There is an upward trend of getting homeopathic treatment for both chronic and acute diseases due to advantages of the system. There are a good number of homeopathic pharmacies manufacturing standard homeopathic medicines, which are also exported. Homeopathic medicines are freely available in Pakistan and can be bought by anyone without prescription from the doctor. This is because they are safe to use.